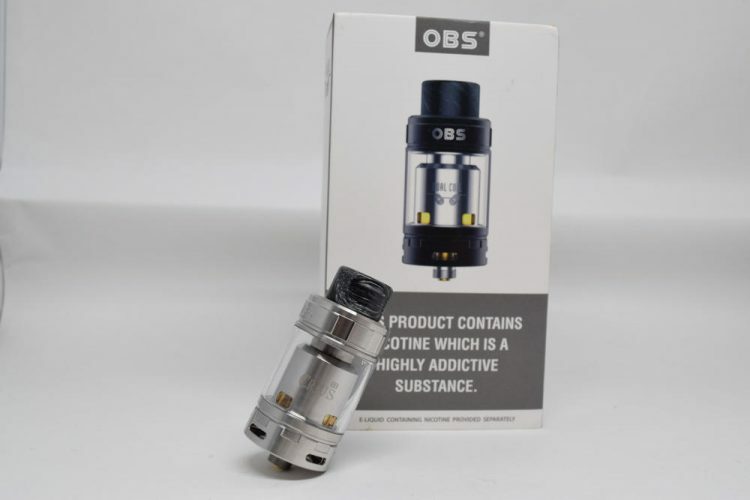 The new OBS Crius II comes in a fairly large slider box with a picture of the atomizer and a gnarly and completely unnecessary nicotine warning on the front, and a list of contents, as well as information about the tank (size, weight,color) on the back. 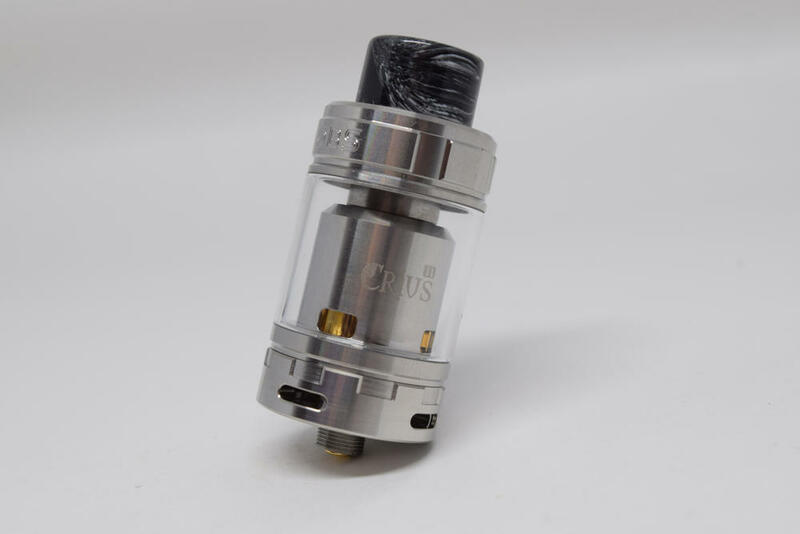 Pull on the little textile handle on the side of the box, and you’ll find the assembled Crius II dual-coil RTA as well as a box of accessories. Inside that yellow box, you’ll find a spare glass tube for the tank, a couple of ready-made coils, some silicone o-rings, a small screwdriver, a sheath of organic Japanese cotton and a user manual. It’s pretty much your standard atomizer kit, although I do appreciate OBS going for the slider-type box. It was an escape from all the classic cardboard boxes that most other companies use these days. 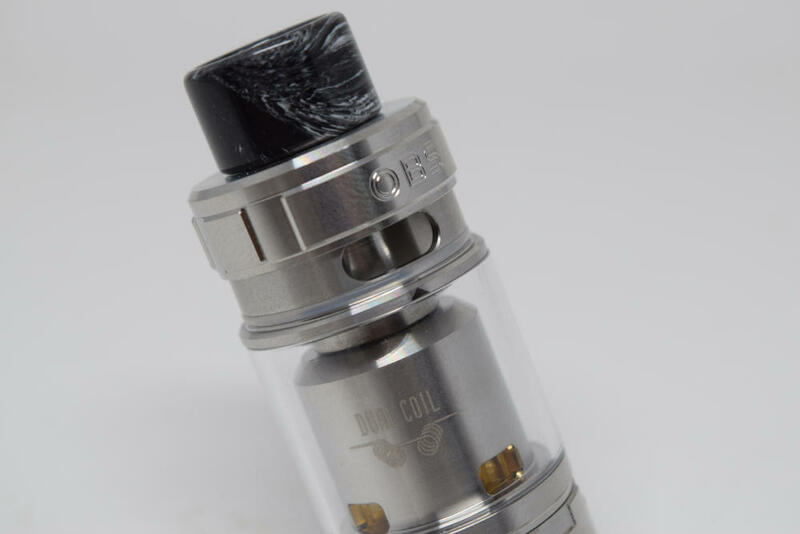 As I said in the introduction to this review, the dual-coil version of the Crius II RTA is completely different that the single-coil one released last year, both on the inside and on the outside. 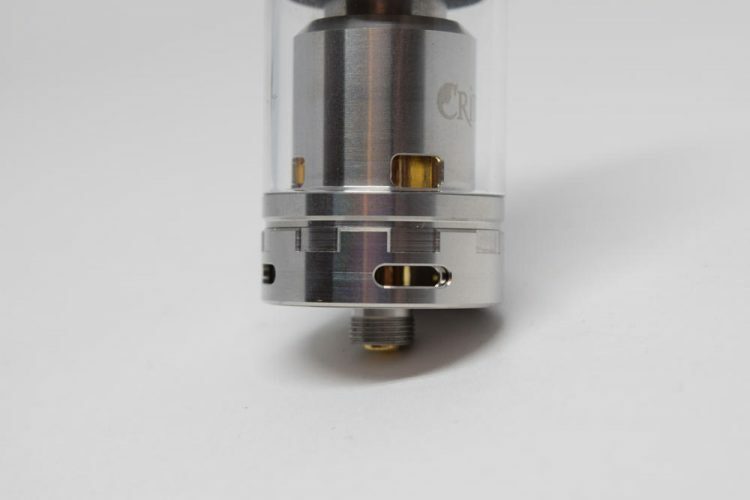 This new Crius II measures 42mm from top to bottom – not including the drip tip and connector pin – and 25mm in diameter. It weighs 63 grams, which is just about the right weight for its size. It has a juice capacity of just over 4ml. Starting from the top, we have a wide bore resin drip tip which, at first glance, appears to be an 810, but is actually an outdated 510 type. I love the look of it – black resin with white accents – but I personally would have preferred the wider 810. Then we have the stainless steel top cap, with the OBS name etched into it, which conceals the patented OBS filling port. Just pull on the top cap and it will reveal a large slot on the side of the atomizer through which you just pour juice into it. When you’re finished, just press the top cap back down and you’re good to go. Then we have the glass portion of the tank, through which you can see the massive atomization chamber with four juice control slots cut into it, and a very short chimney. The base is pretty standard, featuring an airflow control ring and four medium-size air slots. At the very bottom, we have a gold-plated, non-adjustable 510 pin. At first glance, the OBS Crius II dual-coil is not the most exciting-looking atomizer on the market. It has a fairly classic design, a very clean line, but it doesn’t really stand out in any way, like the OBS Engine did when it launched. But don’t be fooled by this tank’s tame appearance, it really is a beast in sheep’s clothing. Now for the part that matters most – the build deck. Well, if you’re a fan of OBS products, or if you just happen o be familiar with the company’s Crius RDA, you’ll probably recognize this particular build deck the moment you see it. They literally took the exact same clamp-style deck from the Crius RDA and adapted it slightly to fit the RTA system. The deck itself is exactly the same, only instead of a juice well, we now have four wicking slots and two massive bottom airflow holes. So now that we’re familiar with the design of the Crius II dual-coil RTA, let’s talk about setting it up for the first time. Dual-coil RTAs can be pretty tricky to build on, but that’s not the case with the OBS Crius II. Thanks to a very simple and intuitive clamp system, you can get it done in a couple of minutes or less, depending on how experienced of a builder you are. But first things first – take the atomizer apart, give it a good wash under running hot water, lave it to dry or use some paper napkins to speed up the process. Once that’s over with, it’s time to work on the build deck. Basically, all you need to do is loosen the screw on top of the gold-plated clamp until you see some space between the positive and negative posts and the ceramic buffer between them. Then, insert one of the coils from one side, and the other from the opposite side, hold them in place with your thumb and index finger, and tighten the screw with your other hand. Once the clamp is tightened down, straighten the coils and make sure they are positioned above the massive air slots at the bottom of the deck. That’s it, you’re ready to wick. Now, wicking is always a bit tricky on RTAs, but even more so on OBS products. I remember the Engine being particularly problematic in this area, which resulted in me having to rewick it several times. The Crius II dual-coil is not much different, but luckily I have more experience this time around. Essentially, all you need to do is make sure you don’t overdo it with the cotton. Cut your leads as short as possible, as you only need the cotton to reach about halfway into the wicking channels,. not fill them up completely. The idea is to prevent the atomization chamber from flooding, while at the same time allowing the juice to reach the coils easily. I personally like to thin out the cotton leads a little bit as well, to make sure that they don’t hinder wicking at all, but that’s just personal preference. What is important to keep in mind is not to stuff the cotton in the juice channels, but gently guide it in there and make sure it stays relatively loose. Once you’re done with the wicking, put a few drops of juice on the cotton to prime it, and screw the base back on to the top part of the tank. Next it’s time to fill this baby up with e-liquid, but before you do that, make sure that the juice flow control slots on the barrel of the Crius II are sealed shut. You can open and close them by gripping the base of the RTA and rotating the glass tube clockwise. Then, all you have to do is pour juice through the fill port concealed by the top cap. That’s about all there is to it. I have to admit that I did not have high hopes for the OBS Crius II RTA. I hadn’t really been very impressed with either the OBS Engine or the Engine Nano. 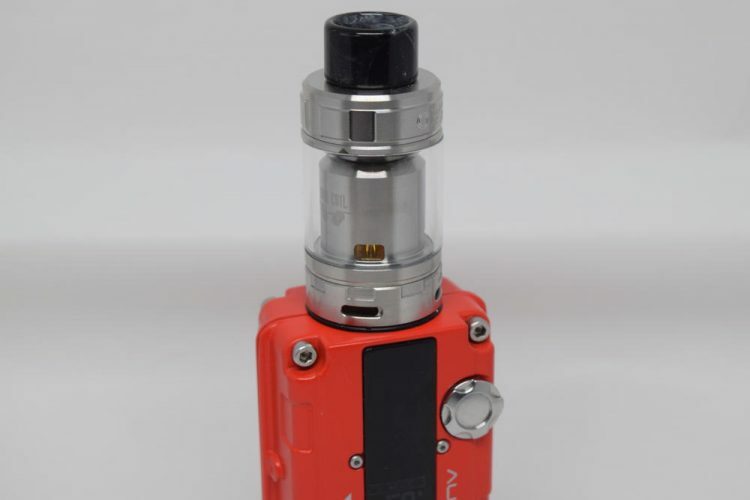 Everyone else seemed to love them, but I just always preferred other tanks and RTAs to them, and I thought the Crius II would just be more of the same – ok, but nothing to write home about. I couldn’t have been more wrong. Long story short, this is my new favorite dual-coil RTA, and it wasn’t even a close call. I had been gushing over the GeekVape Blitzen thinking RTAs couldn’t get much better, but the Crius II just blew it right out of the water. Vapor production is actually about the same, but in terms of flavor, the OBS Crius II is on a whole other level. I couldn’t tell you exactly how it squeezes so much flavor out of e-liquids, but I suspect it has to do with the bottom airflow slots pushing the vapor straight up, and with the very tall atomization chamber that stretches up almost to the bottom of the drip tip. Whatever it is, it works. I’ve been using the OBS Crius II with the stock coils that came in the box, so I’m sure you can get even more vapor and better flavor with some exotic coils, but I’m more than satisfied with its stock performance. I have yet to read any other reviews on this atomizer, but I doubt anyone can complain about its performance. It’s a superb tank that I for one will be using a lot going forward. Leaking has not been an issue for me, but that doesn’t mean that the Crius II can’t leak. It all depends on how well you wick it. 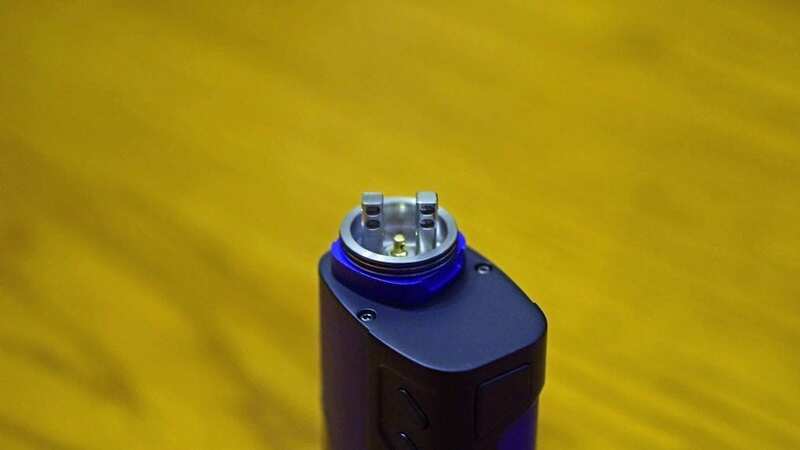 If the cotton doesn’t seal those juice slots properly, juice will get into the atomization chamber and leak through the bottom airflow slots, so pay close attention to that. I have not tried all of OBS’ atomizers, but I have a feeling that the Crius II dual coil may just be their best one yet. It’s easy to build on and wick, has excellent build quality, and its vapor production and flavor intensity are simply impressive. If you’re in the market for a new dual-coil RTA, I highly suggest you at least consider it. Just make sure that you don’t get the original Crius II, which is a single-coil atomizer. The company Coil Master , already for a long time pleasing the steamers with their devices and accessories for wapping, decided to expand its assortment of atomizers, releasing RDTA under the not quite suitable, I think, for this type of device called Genesis. We will consider it in this review. 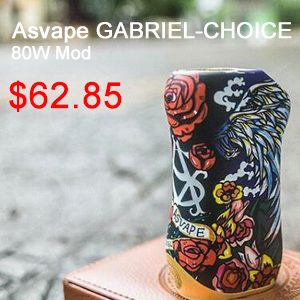 Comes Genesis RDTA in cardboard packing, painted in the company’s colors Coil to Master Master : black and red. On the front side of the package there is a name and a brief description of the features of the device. On the reverse side, we will see a bundle, specification and a label with the RDTA color marking. On one of the sides there is a scratch code for checking originality. Focus On www.ave40.com For More Vape Tank. Genesis RDTA has a standard package. Its complete list is presented in the table below. Genesis RDTA is a classic bacodrip, externally and with a constructive almost no different from COMBO RDTA, manufactured by IJOY. The company Coil Master does not introduce non-standard technical and design solutions, but made it old-fashioned, but very high quality, however, for the quality I love the devices and sets from this company. Genesis RDTA has a lateral adjustable airflow, side fueling, massive bicycle racks, allowing to accommodate almost any “fantasy” of the co-builder. Bacodrip works only in the mode with two spirals. The device is made of 304 stainless steel. Genesis RDTA is available in two colors: steel and black. Genesis RDTA , like any classic bacodrip, consists of a base with a 6 ml liquid tank, skirts, domes and drip-type located below. Drip-type non-standard, the landing diameter of 15 mm, is made of delirium, densely held on the dome with the help of two o-rings. 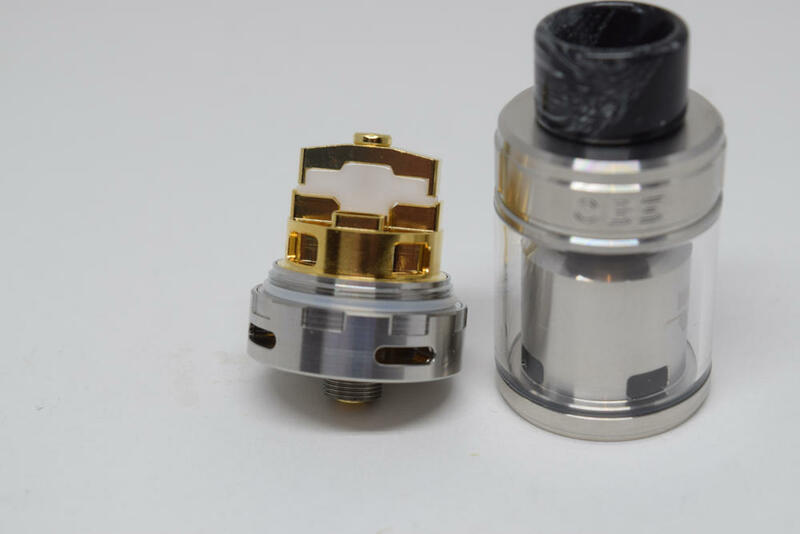 The adjustment of the lateral blowing is realized by means of two cutouts on the lower part of the dome, which can simultaneously open / close the two airflow slots consisting of four holes located on the RDTA skirt, thereby adjusting the air supply to the spiral. At the same time, the dome itself is securely held by means of two O-rings. Inside the dome, a “flavor” spherical treatment is performed. The skirt is steel with two side airflow slots. 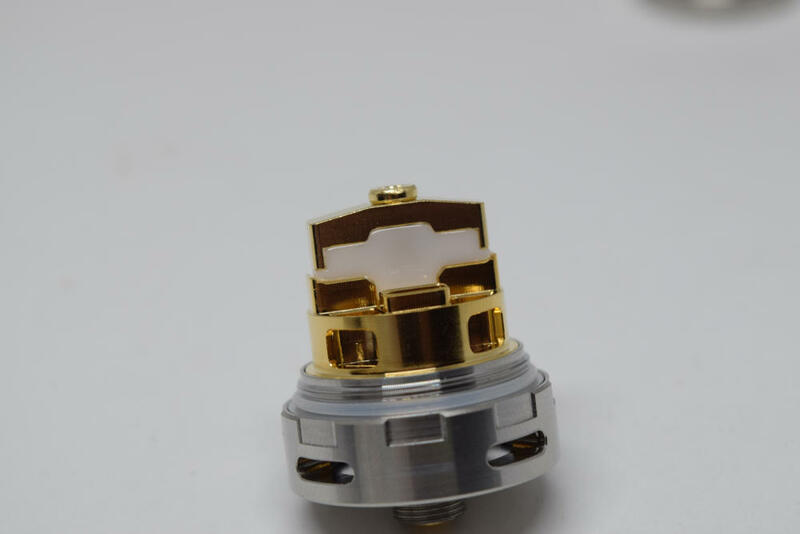 It is held on the basis of RDTA using a large O-ring. When considering the device base, no novelties, unfortunately, are not revealed: already become standard Velocity racks with rather large holes for fastening spirals. Moreover, it should be noted that the bases and the skirt with the dome from COMBO RDTA are fully compatible with Genesis. 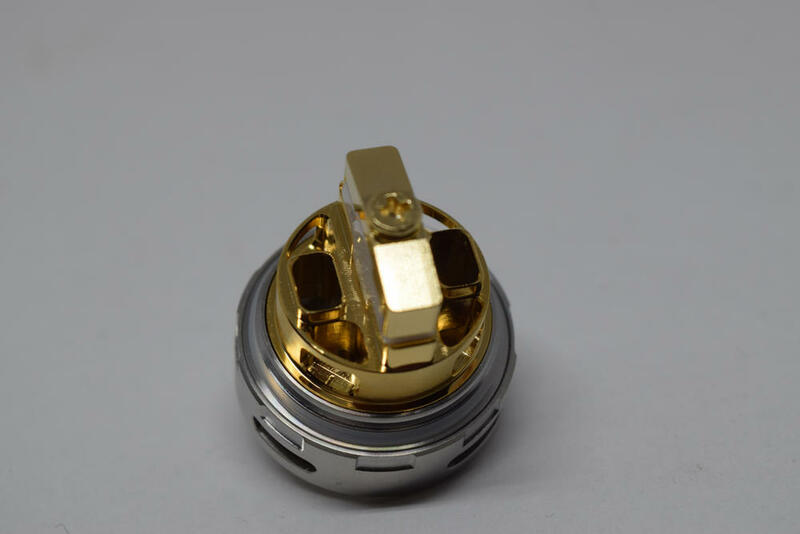 On the back side of the RDTA is a gold-plated adjustable pin; certificates; information about the manufacturer and the name of the device. No features in the installation of spirals and cotton packing, this atomizer did not present, everything is standard, as well as on dozens of other RDTA. The only thing I want to note is the horizontal axis of the spirals, located slightly above the blowing slots, which allows you to get a pseudo bottom blow and a small gain in taste. Whisking does not make sense to lower it to the very bottom of the tank, thereby reducing its volume (and it is just needed, because at a power of about 100W the liquid is melting in front of the eyes). 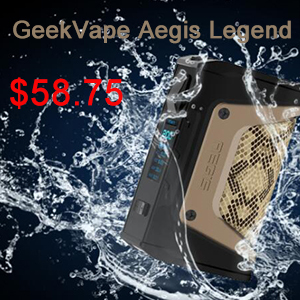 Unfortunately, I did not see anything extraordinary and innovative in the Genesis RDTA . The taste and dross on such devices will depend entirely on the spirals installed in them, so there is no sense in judging the “markers”, they are all different. Of nit-picking, I can produce too much skirt height with a dome, which increases the evaporation chamber, concealing the taste. A large O-ring, which holds the skirt on the base, is constantly jammed when refueling. But, in general, this device is not bad and fully works out the money invested in its purchase, especially since its cost in the online store of Coil Master company is only $ 30, which is quite good for the original device from the eminent manufacturer. On the site of the company Coil Master you can pick up for yourself and purchase the necessary materials and devices for working with serviced atomizers. Let’s consider some of the novelties. Coil Master Ready Box – a small set for serviced atomizers, consisting of 3 pairs of pre-wound spirals and twelve plates of high-quality Japanese cotton. Perfectly complement the camp kit Coil Master DIY Kit Mini . Item SPEC. ID (mm) Material Res. Coil Master Skynet – a set of eight types of pre-engraved coils in the original plastic packaging. Each of the cells of the improvised “box” contains six ready-made spirals. Coil Master did not ignore the fans of the new-fashioned “toy” spinner, releasing a branded product – Spinner 1 . 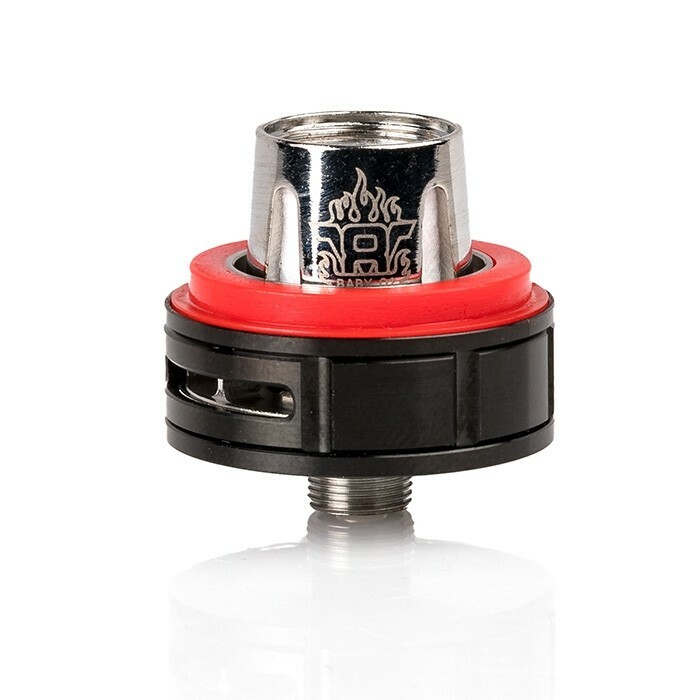 This spinner with the extension for the 510th connector can be mounted on the mechanical mode, after which you can screw up any of your atomizer from above. In my opinion, it turned out quite amusing “trinket”, but, I think, no one will consciously go on making contacts in the electrical circuit of Mehmod, introducing additional resistance, thereby reducing the effective power. 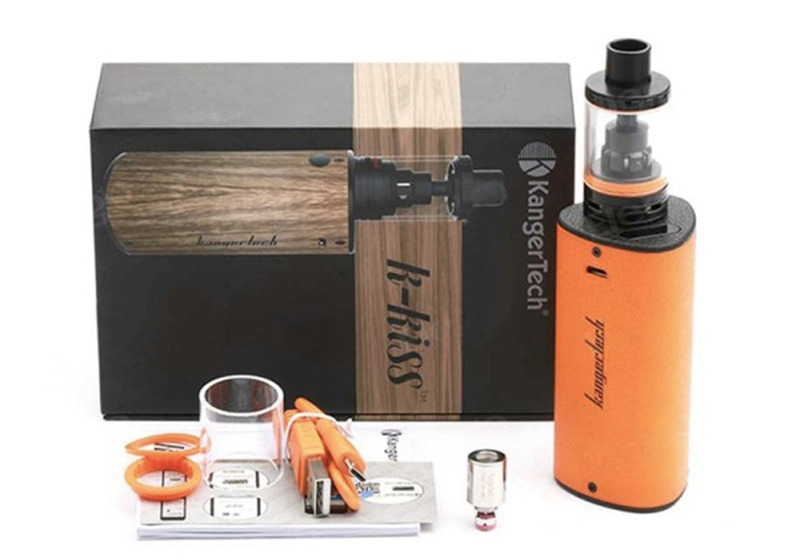 Kanger has recently focused on the mods segment for beginners and seeks to create many different devices to suit all categories of novice vagers. 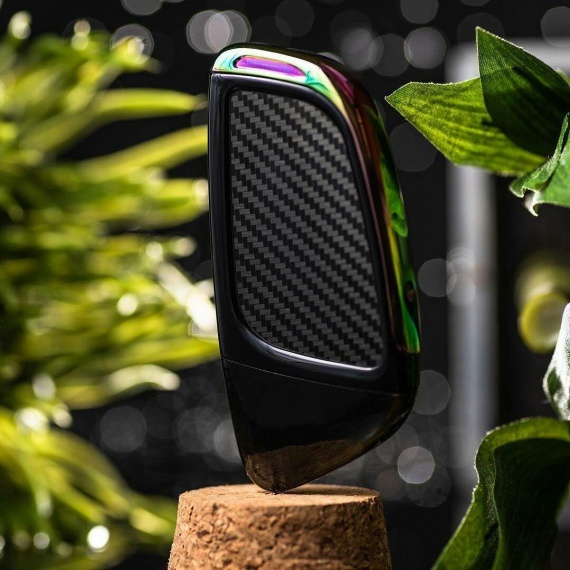 For fans of autonomy, the manufacturer has released K-Kiss – an easy-to-manage mod that stands out for its class-built internal battery of 6300 mAh. Focus On www.urvapin.com For More Vape Start Kit. Since K-Kiss is a starter kit or a beginner kit, a 4.5 ml cliromizer is also supplied with the battery pack, so the beginning viper will only need to buy the liquid. The main difference K-Kiss is in a huge battery and a modest size for such a capacity. Its name is probably due to the design principle, which sounds like “Keep it short and simple” or “Keep it simple, silly”, which means “The simpler (device) is the better.” Indeed, the novelty from Kanger is very simple to operate and very reliable because of this. 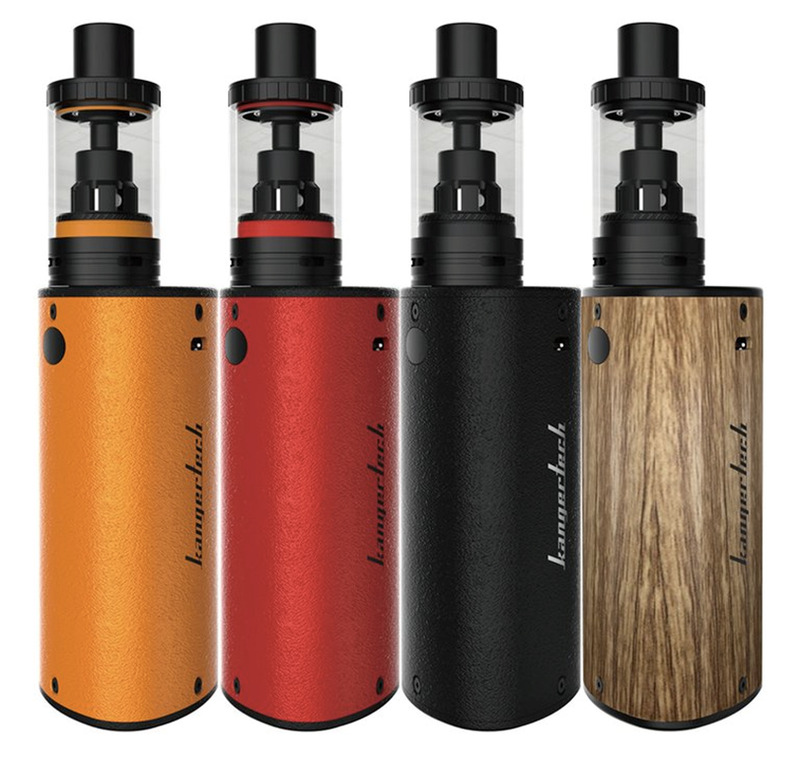 The body of the mod is made of zinc and aluminum alloy, after which it is covered with a special finish coat, which Kanger has already used in the TOGO Mini . This paint is pleasant to the touch, does not allow the fashion to slip out of the hands and not “zalapyvaetsya.” There are four colors to choose from: orange, red, black and wood. However, in the instructions and on the package there are two more colors that are not yet available for order: leopard and “snake skin”. Whether such coloring will go on sale is not yet known. Despite the large battery, the device’s dimensions are modest – 122 x 40 x 40 mm along with the cliromiser. For inconspicuous pairs, the set may come up, but with some reservations. Thanks to the rounded form, K-Kiss falls well in the hand, and the hover button goes directly under the thumb or index finger (depending on the grip). The build quality of K-Kiss is excellent – nothing rattles and dangles, all the details are perfectly matched to each other. 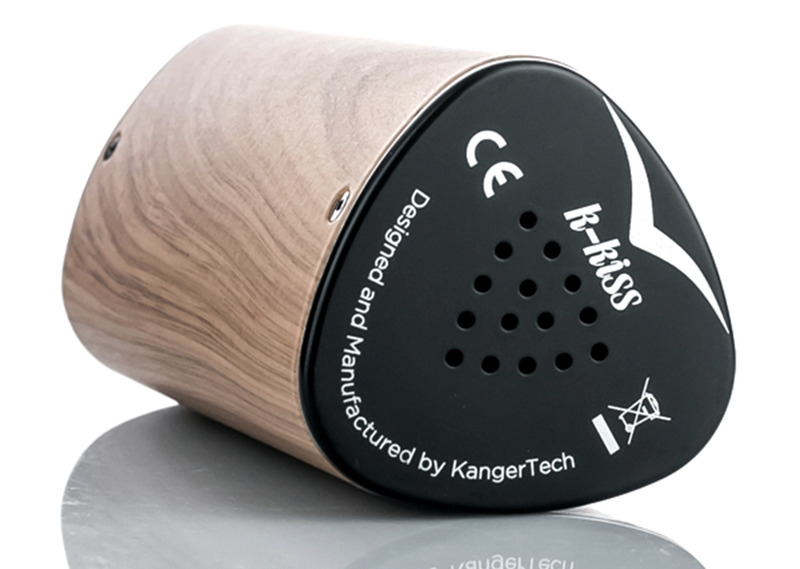 K-Kiss does not have a customizable varivatta, the card of the device independently sets the power, depending on which evaporator is installed and how much battery charge remains. At the full charge of the mode “fry” more strongly, and closer to discharge the amount of steam decreases. The manufacturer did not state the maximum power, but judging from the minimum resistance of 0.15 Ohm, it should be around 50 watts. From 0.15 Ohm. The complete cliromizer has a diameter of 24 mm, so if desired, you can easily replace it with any other with the same diameter. Clears of 25 mm will also work, but larger diameter atomizers will already “hang” and partially obscure the screen mode. In the K-Kiss built-in battery for 6300 mAh. This is one of the best indicators on the market for devices of similar dimensions. In combination with a fairly large tank, 4.5 ml of the mode becomes very autonomous and convenient to use. You can charge the battery via USB-port on a standard current of 1 A. It will take about 7 – 9 hours. The manufacturer has not declared the function of the paste, so it is not recommended to soar and charge at the same time K-Kiss. The mode charge level is indicated by a small screen with five LED indicators. All five means full charge, and one means fast discharge. At a critically low charge, the LED will signal this by flashing. The screen is located next to the cliromiser, so it will always be visible when tightened. Standard steel 510 connector with brass spring-loaded pin. Vent holes to drain gases from the battery. In the K-Kiss kit there is a cliromizer with the same name, created specifically for this whale. This is a modern clay made of stainless steel and Pyrex glass, which is executed in black and is equipped with o-rings in the color of the set. Refueling at the top of the cliromizer. Clear K-Kiss completely collapsible, if desired, you can replace the cracked glass or drip-type. The standard mouthpiece has an unusual design, due to which it allows you to draw more steam. However, the connector at the clinic is familiar 510, so you can install any other drip-type. The capacity of the enema is 4.5 ml. Blowing in it fixed, easy tightening will depend on the installed evaporator. You can use all the evaporators of the SSOCC series: nichrome with a resistance of 0.5, 1.2 and 1.5 ohms, a Clapton Coil 0.5 Ohm cantaloupe, with a 0.2 and 0.5 Ohm stainless steel spiral. The cliromiser perfectly realizes the potential of the evaporators and perfectly conveys the taste, giving out large clouds of steam. For best performance, an evaporator with a resistance of 0.2 ohms is recommended. It should be noted that the evaporators of the SSOCC series are quite popular and can easily be found in stores. Turns on and off the mode five times by pressing the Fire button. Mod K-Kiss received mixed reviews. 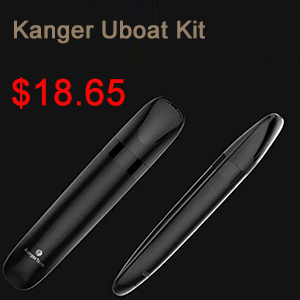 Basically, the experienced steamers negatively responded, who expect from Kanger something new and high-tech, not another product for beginners. Those who rated the device in isolation from the main line of the manufacturer, found it very worthy. Vapers liked the huge and honest battery, which on standard evaporators 0.5 and 0.2 Ohms easily “stands” the whole day of soaring. In other respects, the mode justifies its name. It is very simple and reliable, because there is nothing to break in it. The possibility of error is minimized, which is very useful for a device aimed at beginners. A large battery will also be useful for those who pass from tobacco, who are not yet accustomed to the fact that the cigarette needs to be recharged. K-Kiss gives out a lot of steam and well reveals the taste on the regular evaporators. The disadvantage can be called uncontrolled blowing, which is tuned to something between a tight cigarette and a light hookah puff. Apparently, Kanger wanted to please everyone with such a decision, but it did not work out. However, the lack of adjustment will have little effect on the beginner’s feelings and, again, protect him from errors. 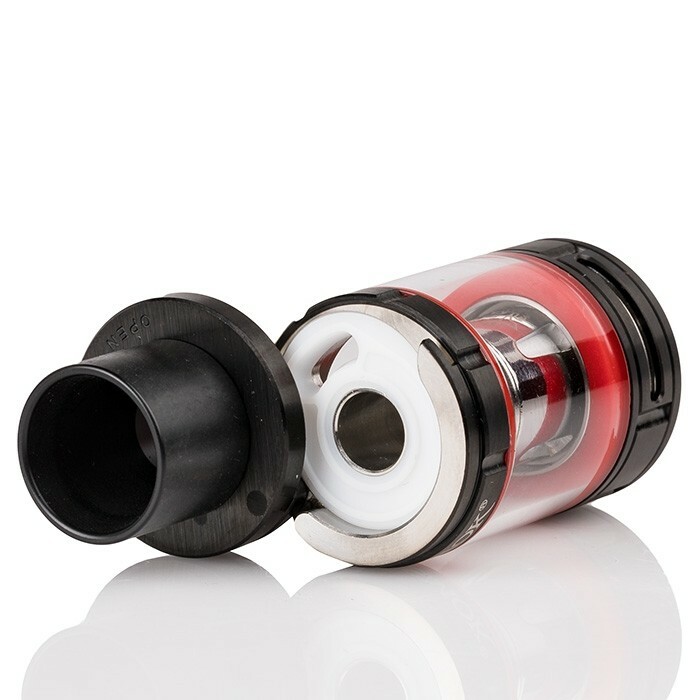 iJoy Captain S Sub Ohm Tank Review Is It Really Groovy? There really is a groove. But does it make a difference? That was the question we set out to answer with our iJoy Captain S sub ohm tank review. Along with the groove, the other feature that might catch your attention is the threadless coils. The coils simply sit in place and are held stable when you connect the tank base to the top. This makes coil swapping much quicker and simpler. The other thing I like about threadless coils is that I don’t have to worry about maintaining the threads. Like Forrest Gump says – “one less thing”. 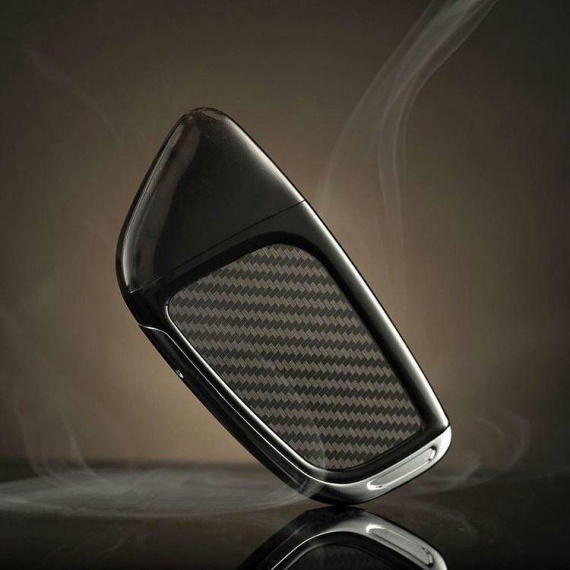 The Captain S is a top-fill vape tank that you access with a newly designed slide feature. 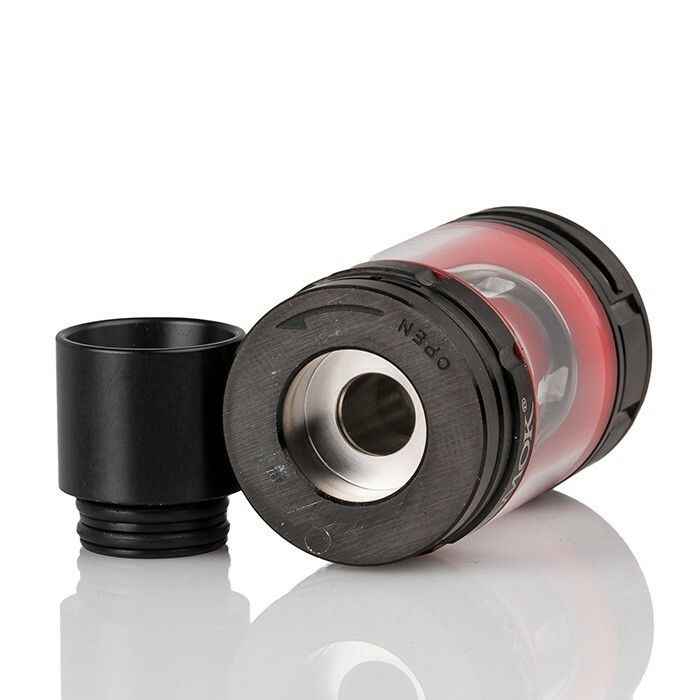 The Delrin drip tip is an extra wide bore style and is not a 510 drip tip. But you do get an adapter that will let you use any 510 drip tip. You also get a gold-plated 510 connection for smooth current flow and corrosion resistance. There is a 2 ml capacity Captain S that is TPD compliant as well as a 6 ml version that will be available at some point. For the Expert Vaping iJoy Captain S review, we tested the 4 ml version. Our review results apply to the other versions as well. 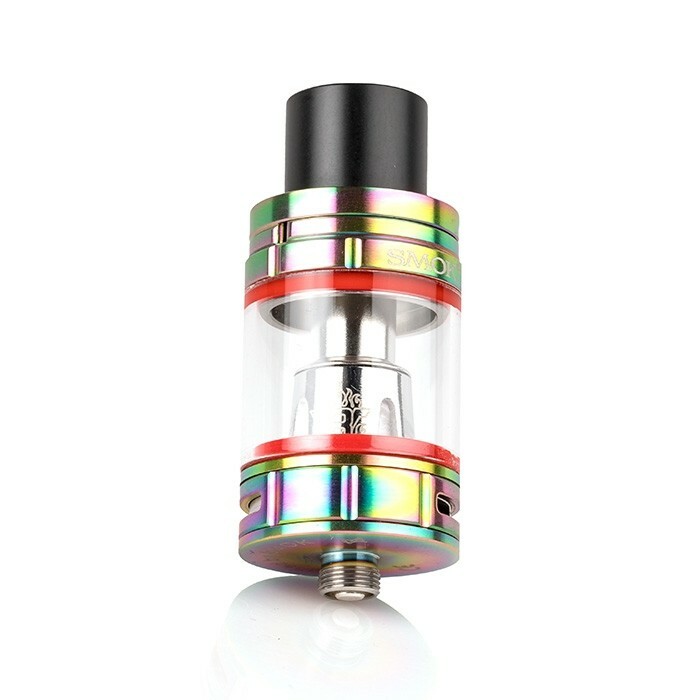 I recommend the 4 ml tank because of the low profile and it is really easy to refill. If you are familiar with the original iJoy Captain vape tank, the Captain S sub ohm tank is an updated version. With the Captain, the top-fill was accessed by unscrewing the top cap. With the Captain S, the top-fill is accessed by opening the slide. The top-fill slide is why this version is called the Captain S. Ess as in slide. The removable top cap on the original Captain tank was fine but the slide top-fill is a major upgrade. With the slide, the top stays attached. You don’t have to worry about losing it or setting it down somewhere when you refill the vape juice. I definitely prefer the sliding top fill on the new Captain S.
Also instead of an extra wide-bore resin drip tip, the Captain S comes with an extra wide bore Delrin tip. This also rates as an improvement. What’s With The Captain S Tank Groove? It’s groovy! I have mentioned it at the outset so now I want you to actually see what this groove is. 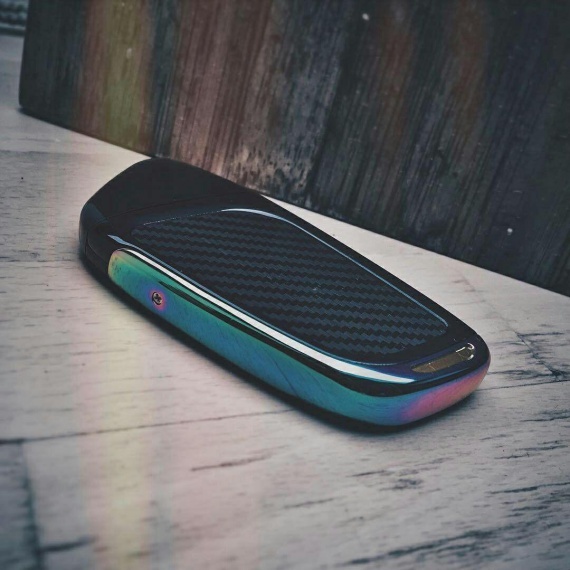 iJoy posted a picture with the groove highlighted in red. Take a gander. The groove is cut into the chassis above where the current comes into the base to heat the coils. The groove limits heat transmission from the base to the top of the tank. This is useful on a number of fronts. It helps to keep the top of the tank cooler. This makes vaping and refilling more comfortable. It decreases the amount of heat the vape juice sitting in the tank is exposed to. If you vape consistently at high wattages of 80 plus, the groove does make a difference. I make the vaping more comfortable and by extension, enjoyable. I use a lot of vape tanks. Good ones. And I can’t honestly say that I have had too many issues with tanks that get so hot they are uncomfortable to use. But, the groove does make a difference and I applaud the innovation. It’s a good idea with no downside. Is the heat groove reason enough alone to buy this tank? No, it still has to vape well! But again it is a neat innovation. People are vaping at higher and higher wattages so managing the heat is important. 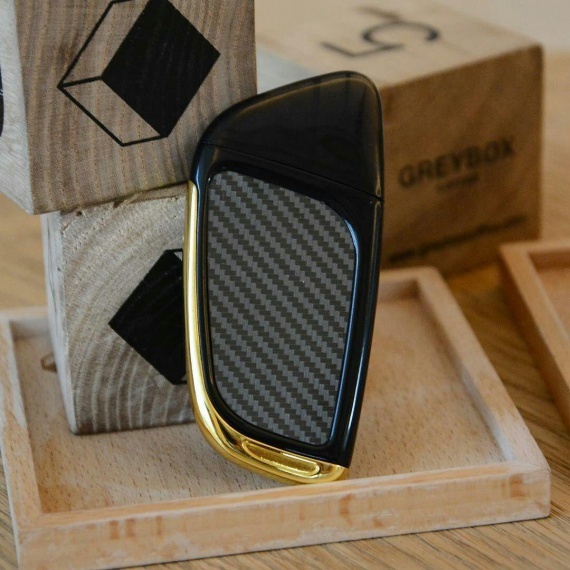 The groove represents an improvement in the design of vape tanks and iJoy deserves credit for that. If you do vape constantly at high wattages, I think you will notice a real difference. Diving into the heart of the iJoy Captain S review we got your tech specs! 4 ml e-juice capacity. We have a 25 mm diameter. That is just a tiny shade under an inch. She stands 59 mm tall and that is 3.3 inches. The Captain S diameter is in the same range as the Aspire Athos tank, Smok TFV8 Big Baby, the VaporFi Vulk, the Slydr, the Halo Jag 6. 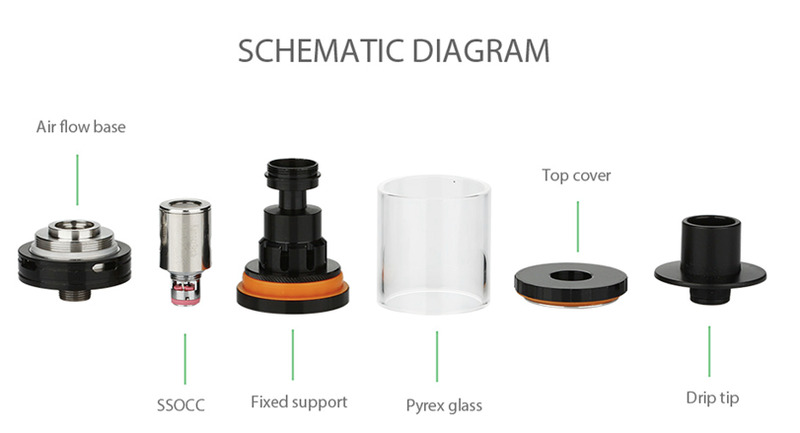 The minimum 25 mm diameter seems to be a staple of the vape tanks with extra large coils. The Captain S also has large coils that allow for more airflow through the center of the coil and deliver more flavor and vapor. Excellent. The adjustable airflow at the base of the tank is a dual airflow. Very easy to adjust. In fact, the overall build quality of the iJoy Captain is really outstanding. Perfect machining. Everything attaches and separates smoothly. Here’s the big takeaways here. Excellent build quality. 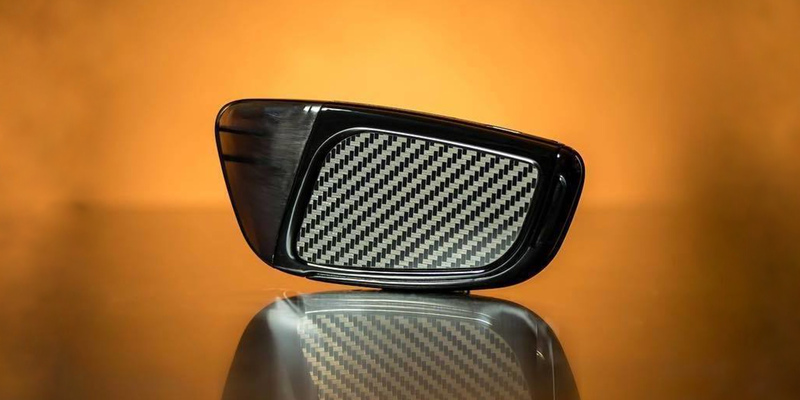 Not only the precision machining and quality of materials, but even the finish is designed for durability. Big threadless coils that draw the air through the center of the coils. Very, very good vapor and flavor. 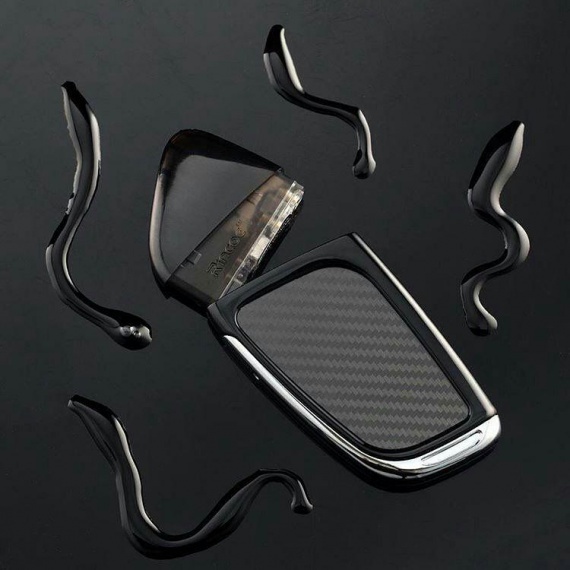 The iJoy Captain S 100% qualifies as an exceptional quality vapor product. iJoy Captain S replacement coils are the same as the original Captain coils. Captain coils have been out for several months now so we know a lot about them. We can definitively say that these are very long lasting coils. And frankly, at $12 to $13 for a three pack, they should be. So at $4 a coil you do end up getting good value because they are long lasting. You should get two to three weeks out of a coil. The real question of where to buy the iJoy Captain S vape tank should be where can you buy a REAL one. There are going to be a lot of fakes out there. Let me tell you, the counterfeiters have become so fast at filling the market with fakes I would actually be impressed if it weren’t so underhanded. Make no mistake, counterfeits and clones are junk. You will not get a good vaping experience and in many cases, they can even be dangerous. Stick with the real thing. Stick with authentic product. If you see a Captain S being sold somewhere for a price that seems too good to be true, it’s likely a clone. Right now you can get an authentic iJoy Captain S tank from Heaven Gifts, an authenticated vendor. The price is $33.90 and you can use coupon code AHG10 to save a few bucks. That’s where we bought ours. Yes, we bought ours. We did not get a bunch of freebies and do some giveaways in exchange for a good review. We are interested in the entire customer experience and we don’t like feeling like we need to give a good review if we don’t want to. If you also happen to be looking for a new mod, please note that you can get the Captain S tank in a kit paired with the new Genie PD270 vape mod. The Genie mod is a 234 watt device with a number of features like LED lighting and a for real flashlight. By the way, that number designation, 270, relates to the batteries that come with the Genie mod. They are 20700 batteries that have about 30% more capacity than your standard 18650s. No RBA deck. Can’t build your own coils. Currently only three coil options. No TC coils yet. The last thing I mentioned in the Pros section of our iJoy Captain S vape tank review is something I want to elaborate on. 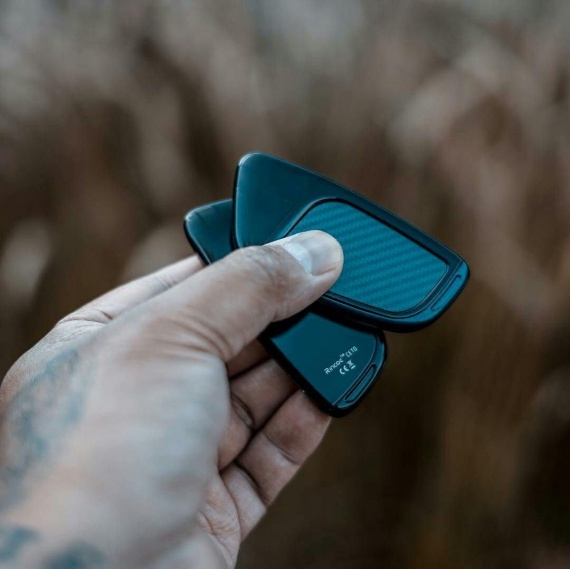 In terms of ease of use, the iJoy Captain rates at or near the top of the heap. Because the build quality is so good, it is very easy to unscrew the base and pop in a new coil. Plus the new slide-top fill makes refilling the tank a quick process. The Captain S is suitable for newer vapers looking to try sub ohm vaping. Author kittyurvapinPosted on August 30, 2018 Categories UncategorizedLeave a comment on iJoy Captain S Sub Ohm Tank Review Is It Really Groovy? Squonking became incredibly popular towards the end of 2017, and we saw a lot of squonk vape mods being released. However, many of them were fully mechanical or unregulated which some vapers may not prefer to use for various reasons. In this vape review, we’ll be covering the new Sigelei Fuchai Squonk 213 150w Kit, which is not only regulated, but also compatible with the new battery sizes we’ve seen in many new mods which are 20700 and 21700. 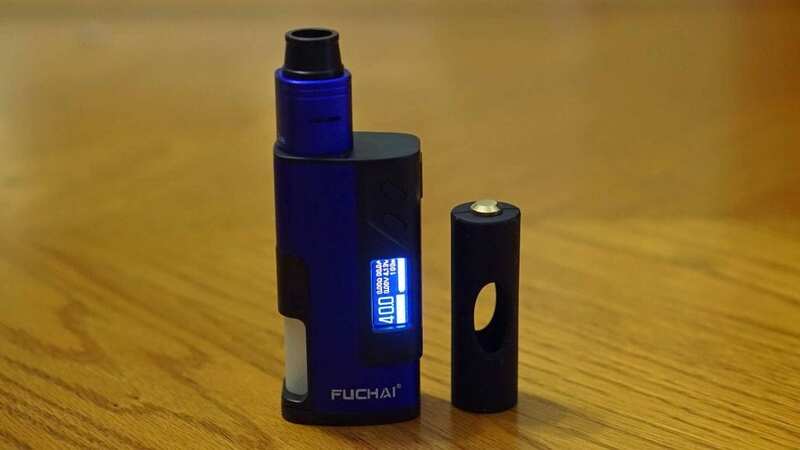 The Sigelei Fuchai Squonk 213 Kit comes in a pretty nice box that shows the name and image of the kit on the front and on the back it shows some information about what’s included. Everything inside of this box is packaged quite well, so you don’t have to worry about it when it’s in transit, which is always a good thing! Once you slide open the packaging, you’re immediately met with everything that’s included. I do want to mention that I did receive the blue color option, but there are other colors available such as Red, Yellow and Black. 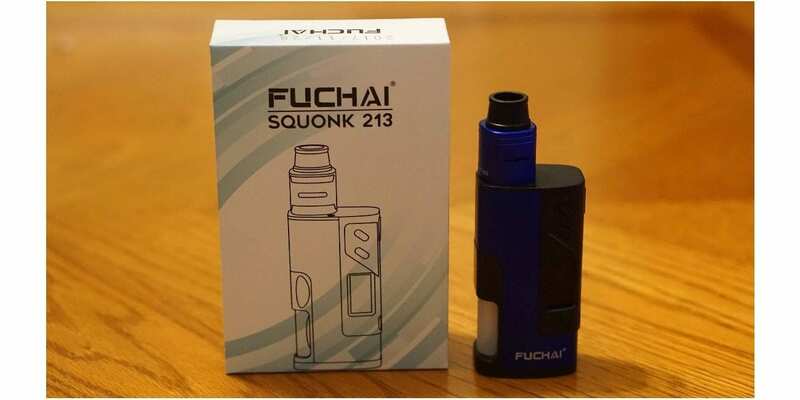 Included with the Fuchai Squonk 213 Kit by Sigelei, you do receive the Fuchai Squonk 213 150w Box Mod, Fuchai or Cubic RDA (I’ve seen this RDA advertised as either one of these names so just stating both), a USB cable, Manual, warning card, bag of spare parts, another squonk door which covers the squonk bottle and an 18650 adapter which is already installed in the device. You do receive quite a lot with this squonk kit, so I’ll give it a pro there for sure. Upon looking at the Fuchai Squonk 213 Box Mod, I first noticed its similarities to the original Fuchai Mod, which was pretty popular. 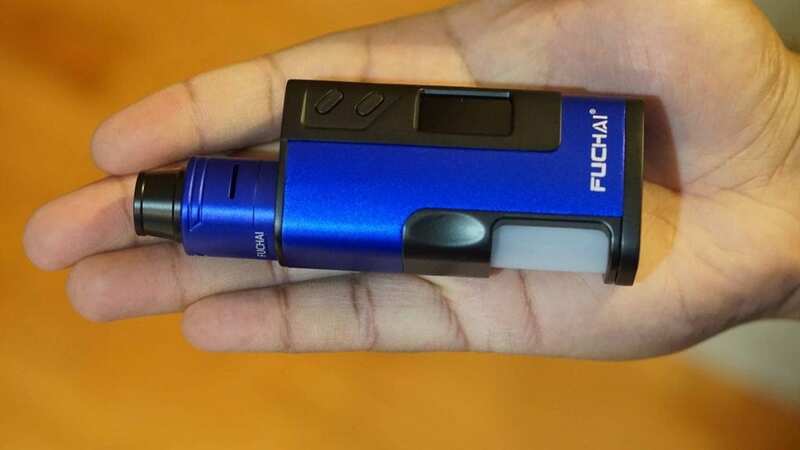 I personally like the design of the Fuchai, so I was happy they stuck with it. The only different with this new version is that it features squonking and it takes the place of one of the battery slots, making this a single battery vape mod. I also noticed the really soft silicone squonk bottle that’s included in this vape starter kit. It’s very soft and easy to press, but it’s very small and can only accommodate 5ml of e-liquid. This was a bit of a let down for me, and I do wish it was a bigger bottle, say 7ml where you can easily find a replacement if you didn’t like the included one or simply need a backup. Finding a 5ml squonk bottle isn’t the easiest, as 7ml is pretty much the standard I’d say. This is a con for me as I already knew with a 5ml bottle, you’ll be filling pretty often. The included atomizer is pretty basic, and does come in a color to match the Fuchai Squonk Mod. It does feature side airflow, and it looks to be quite a lot of airflow. In addition, it’s not adjustable which is another con in my book. 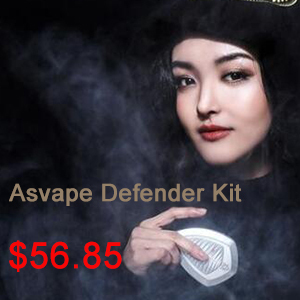 I’m glad they included it though to make this a full kit so the vaper can test out to see if they like squonking without having to invest into a squonking RDA plus the mod, they can simply just get a full kit such as this. The included drip tip is constructed of delrin and it does feature a wide bore, which is something many vapers enjoy, including myself. Overall, my first impressions of the Sigelei Fuchai Squonk 213 150w Kit was good. There were some cons I had initially, but none of them were deal breakers. I was definitely excited to build and wick this RDA and see how this entire setup performed! As mentioned earlier, the included Fuchai or Cubic RDA is pretty simple, which is a good thing, especially if you’re a beginner. This RDA atomizer features a two post velocity styled build deck, which is still one of the easiest build decks to install coils in my opinion. It’s not as great for exotic coil builds with thick leads since these posts have a tendency to twist your leads, but it’s not a major issue. There is a good amount of room in this RDA as well, so you can easily fit Fused Claptons or Aliens if you desired. My preferred coil build was actually a dual Fused Clapton with about 6 wraps each, which had a resistance of around 0.2 ohm. Installing these coils were quick and easy, and building on this atomizer will not be an issue for the beginner or advanced user. Wicking is pretty straightforward as well. This RDA does have a rather deep juice well and a squonk pin is pre-installed. When wicking this RDA, be sure that your cotton does touch the bottom of the juice well, but do not stuff your cotton in there. Make sure your cotton is nice and fluffy to ensure effective wicking during squonking. Lastly, be sure not to cover the squonk holes in the middle, you want the e-liquid to be able to freely flow to both sides of the build deck with no issues. Overall, I must say when it comes to building and wicking the included RDA, it’s incredibly easy. Its two post velocity styled build deck makes coil installs a breeze and the juice well is deep so you can get a good amount of cotton in there with no troubles. The Fuchai Squonk 213 150w Box Mod is shaped and sized similarly to the original, so it’s very comfortable to hold. In addition, there’s no sharp edges to be found whatsoever. What’s even better is that when you hold it in your hands and using your thumb to press the fire button, your ring finger naturally lays by the squonk bottle, so the way it’s designed it really great for squonking. This is a huge pro in my book! Also, with its size you can easily carry it in your pocket or book bag with no issues. This device is compatible with three different battery sizes which are 21700, 20700 and 18650. You can only use an 18650 battery with the included adapter. However, when using a 21700 or 20700, there is no adapter needed. It’s definitely another pro that this squonk vape mod is compatible with all of these battery sizes, as there aren’t many on the market that is able to do so that’s mass produced and priced affordably. I do want to mention that when you are using a 20700 battery, there is a slight battery rattle. You can especially feel the battery rattle when you’re moving the device back and forwards. I’m not sure why exactly, but it’s a con to be mentioned. I haven’t noticed this battery rattle when using the other battery sizes though, so that’s a good thing. Something else to mention is that the squonk door, which you can take off to access your squonk bottle, does have some play to it. It is secure in place, but it moves just a bit too easily for my liking. The Sigelei Fuchai Squonk Mod features a color display screen which is bright and clear, so it’s easy to see in pretty much any situation. It’s right on the front, and right above it is where you’ll find the wattage up and down buttons. The fire button is located on the side by the fire buttons. Using this device is pretty simple, and is the same as the previous Sigelei Fuchai Mod. 5 clicks of the fire button will turn this device on or off. Pressing the fire button 3 times will enter the menu where you can choose the different temperature control options alongside the standard power mode. The TC options are Ti, Ni200, SS304, SS316, and SS317. Pressing the fire button and wattage up button at the same time will allow you to adjust your preheat settings. You can also lock the buttons by pressing the fire button and wattage down button at the same time. Lastly, by pressing the wattage up and down buttons at the same time will allow you to lock in the resistance (for TC mode only). The last thing I want to mention when using this device is that all of my atomizers say flush and made a connection with zero issues. It can house atomizers up to 25mm without a overhang, which is most certainly a pro! Overall, using this squonk vape kit has been great! There were some minor annoyances like the squonk door and battery rattle, but nothing that really made me want to stop using it. This squonk mod is very easy to use, and best of all, it’s compatible with three different battery sizes! The Sigelei Fuchai Squonk TC Box Mod does have a maximum wattage output of 150w. Now, with a single battery, I highly doubt it can reach this amount of wattage and not sure why Sigelei would even advertise it as such. I would say this device is more along the lines of 100w rather than 150w, but only when using a 20700 battery since the available 21700 batteries aren’t the greatest. When using an IJoy 20700 battery, I will say that it does feel like it’s giving 100w or very close to it, but you won’t be continuously vaping at this wattage for long due to battery sag. If you’re a vaper who is in need of 80w and above, then I would highly recommend checking out a dual battery squonk mod such as the Geekvape GBox which will not only give you the desired power, but good battery life as well. With that being said, the battery life I would get from a 21700 or 20700 battery is great! This is certainly the case when vaping at lower wattages such as 50w and 60w. As expected, vaping at 75w and above will limit the amount of battery life you’ll get. 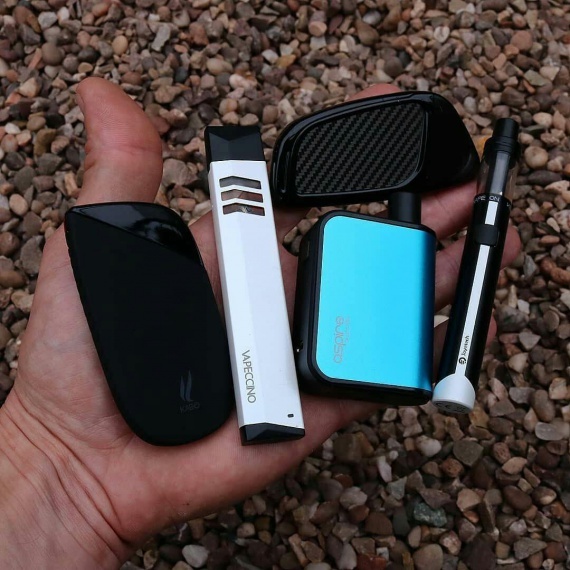 I could get through most of the day without needing to recharge or change the battery when vaping at slightly lower wattages, which is great when considering it’s a single cell device. The temperature control mode does work fine as well and I did only test this device in temperature control for stainless steel wire. It does feel quite accurate in regards to the temperature setting, and the ramp up is fast thanks to its preheat function. Going by how it performs in TC mode for SS wire, I would say it’ll work just as great in Ni200 or Ti mode. It’s not on par with the likes of a DNA Box Mod, but it’s satisfying. Something worth mentioning that since the squonk bottle is only 5ml, you will be filling it pretty often. I found myself filling it every 2 hours or so, depending on how much I was vaping. Thankfully it’s very easy to access and fill. You can always use a squonk refill bottle so you don’t have to take out the silicone squonk bottle. I do wish they made that area just a bit bigger to accommodate bigger bottles as I would’ve loved to use the Lost Vape silicone squonk bottle or something else for more capacity. Now onto the performance of the included RDA. As mentioned previously, it does have side airflow, which is not adjustable and it is quite airy for me personally. It performs fine, but it’s not going mind blowing and I wasn’t expecting it to be. The flavor is decent, and the vapor production is great. I’ve been personally using this device more with a single coil RDA such as the Pulse 22 BF RDA which not only gives me better battery life due to it being a single coil, but much better performance as well. Honestly, I think this kit should’ve included a single coil RDA rather than dual coil as it’s more fitting for a single battery regulated squonk box mod. The overall performance of the Sigelei Fuchai 213 Squonk Mod was solid. However, The same cannot be said for the included RDA. It’s a decent performer at best, but it’s not a bad atomizer to be included for those first getting into squonking. In conclusion, the Sigelei Fuchai Squonk 213 150w Kit is a decent performing squonk vape kit that’s priced well. I do think this is a pretty decent squonk kit for those looking to step into the world of squonking since it comes with basically everything you need aside from batteries and e-juice. There were quite a few cons to this one, and most were annoyances rather than major cons. The first few are annoyances such as the slight battery rattle and the squonk door having some play to it. With the Fuchai or Cubic RDA, I honestly didn’t expect much just by looking at it, and for what it is, it’s a fairly decent performer. Like said before, it’s not going to have the best performance, but it’s decent enough for the beginner wanting to get into squonking. The 5ml bottle is simply a let down, and there should’ve been a larger capacity for sure. The fact that Sigelei markets this as a 150w mod is just inaccurate as it’s just not possible in my opinion to get 150w from a single cell. Overall, it’s a decent squonk kit for the price and I do think it’s a solid entry for those looking to get into squonking. You have all the safety features of a regulated mod, which is great for the beginner. There honestly aren’t many single 21700 or 20700 squonk mods on the market, and I think this is a big reason as to why vapers would want one. This is pretty much one of the key reasons as to why I’ll keep using this one, just not with the RDA. So if that’s something you’re looking for and don’t mind the cons listed, then I can definitely say check one out, as it does pretty much as expected and it’s very comfortable to use. We hope you find this review helpful in finding the right squonk starter kit to fit all of your vaping needs! Feel free to leave any questions or comments down below! Thanks for reading! Like other Tank manufacturers, when SMOK first introduces a new tank, or a new mod, it will be released in a Stainless color/finish and a Black color/finish. Early Adopters will buy them, others will wait and see. SMOK will pay close attention to feedback to sales numbers, and reviews. The thing about Chinese manufacturing is that they can turn on a dime, and if something needs changing or fixing, within two weeks the fix or change is out there. It’s truly breathtaking to see a product go from prototype to shipping product in a couple of weeks. Okay, so anyway, if early sales look good for the new tank, several days later, sometimes sooner, they announce anywhere from 6-10 new colors for that tank. After that, well, it’s either a new tank, or a new version, or some new design tweaks. 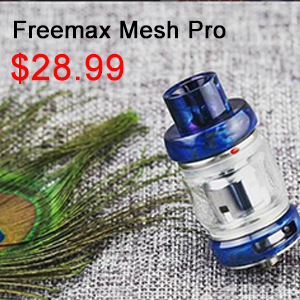 Because the TFV Big Baby Sub-Ohm Tank is so good, and so popular, SMOK had to move slow, and deliberate, so as not to knock the apple cart. No matter what they chose to do, one thing was sacrosanct; Do not change the way the Big Baby Vapes. The SMOK TFV8 Big Baby Beast Light Edition Sub-Ohm Tank performs every bit as good as the TFV8 Big Baby. The dimensions are exactly the same, even the weight, 60g is the same. And of course, the Coil family is the same. 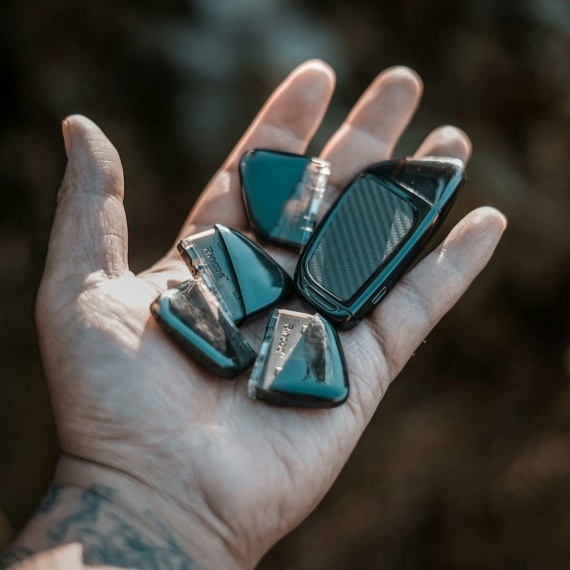 Following the same game plan as other SMOK Tanks, the Cobra Drip Tips will also be available for the LIGHT Edition Tank, as well as a bulb shaped glass tank that expands eliquid capacity to 7mL. (1mL less than the TFV12 Prince)When the LIGHT Edition initially shipped, a Black, Stainless, and 7-Color (Rainbow) were available. Today, SMOK has added a gold, gun-metal, and blue to the lineup. Next week, SMOK will add green, red, and purple to the team. 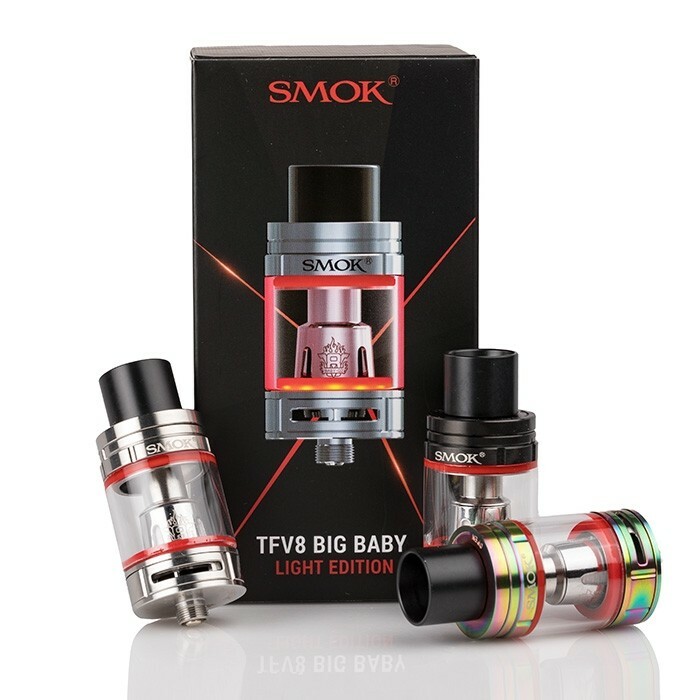 Before we talk about the actual performance of the tank, and how the LED lighting works (and whether its gimmicky or useful), we should note that the TFV8 Big Baby Tank has dropped in price, and has reached “end of life” status. Once production runs out, the Big Baby will no longer be available, at least that’s what I heard. The TFV8 Big Baby Kit included the Q2, X4, and the V8 Baby RBA. The TFV8 Big Baby LIGHT Kit includes the Q2, X4, and T6 (0.2-ohm 40-130W). Equipped with the preinstalled V8-Baby-Q2 Coil, this dual coil 0.4-ohm Kanthal/Cotton coil best vapes High VG juices at 60W. While all SMOK Kanthal Coils can be killed off by Super Sweet MaxVG or All-VG eliquids, The Q2 stands up to Coil Killers somewhat better than the X4 Coil, getting maybe another day of good performance under most conditions. That said, if you like the preinstalled coil in your Big Baby tanks, simply remove the Q2 and screw in the X4 before vaping. 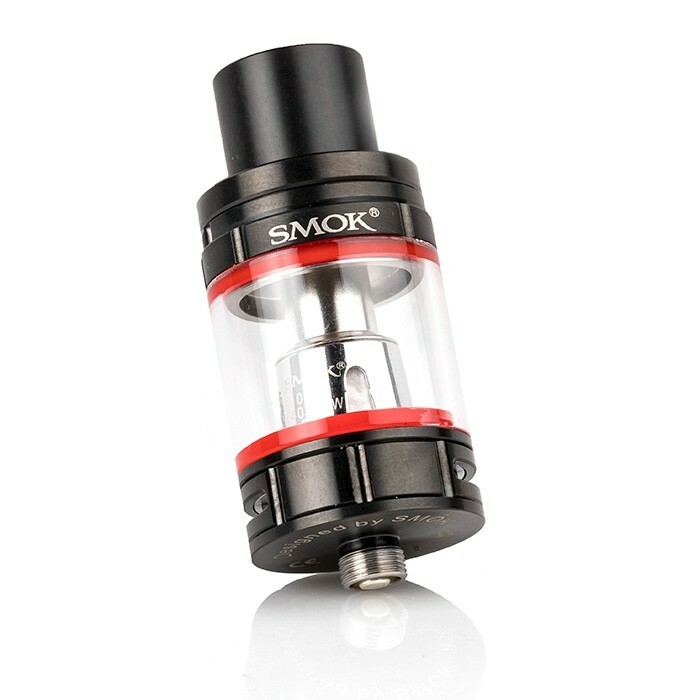 Despite all the SMOK Sub-Ohm Tanks sharing many of the same design elements, the Big Baby, and the Big Baby LIGHT, allow for incredible airflow with the air slots fully open. Drawing in from drip tip, the Coil produces superior flavor and thick, flavorful vapor. 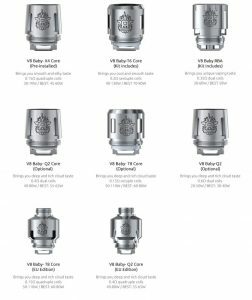 All the Coils perform extremely well inside the Big Baby and Big Baby LIGHT, but there is some control over flavor and vapor with the right Coil choice. 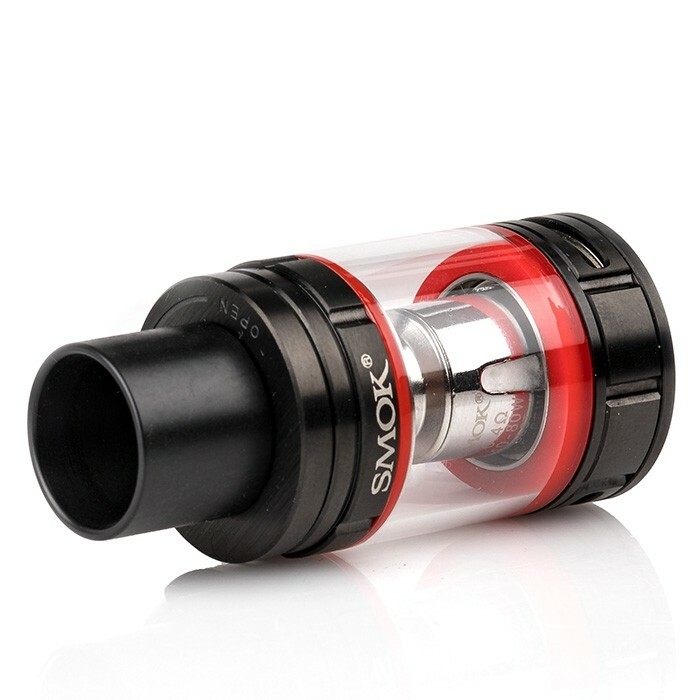 SMOK continues to use the same signature Hinge and Lock Top Fill System, however, what is new to the Big Baby Beast is the LED ring under the O-Ring located on the bottom of the tank. Whenever the user fires up the tank the LED lights activate. Using different colored O-rings can change the color of the LED light. The Big Baby LIGHT Edition comes with several O-Rings of different colors. I have heard that the airflow slots were expanded in the LIGHT Edition, increasing each air slot to 15mm by 2mm. But, for the life of me, I’ve stared at both tanks and I cannot tell the difference in size. Whether the size increased or not, this tank, the old and the new, pump out a crazy amount of clouds and flavor. Ceto by Rincoe – good-looking, and inexpensive. Maybe here it is, ideal? I learned about the existence in the world of a vendor such as Rincoe about a month ago. Yes, the company appeared relatively recently, but by all its actions shows us that it is determined to actively fight for the money of buyers. Of all the presented to me the most liked Ceto . As for me, this baby has every chance of success in its segment, even considering the large number of competitors. 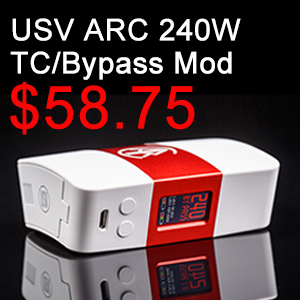 Focus On www.ave40.com For More Latest Vape News. To this conclusion I came, mainly because of the interesting appearance of the novelty. Recently, we have seen a huge number of devices in this niche. For the most part, they all look alike, like two drops of water. But some manufacturers still consider it their duty to work a little on the design. RincoeI would take it to this category. Unlike most of the competitors who try to make their AIO more bright and youthful, Rincoebet on solidity and definitely did not lose. The width is 37.5 mm. Against the background of analogues Ceto looks very adult and definitely will suit those who want themselves something inconspicuous and stylish at the same time. I like everything – compactness, body shape, “carbon” inserts, etc. I would love to go with this device, but my needs are radically different from what the novelty can offer. If this moment was not and I would be in search of a similar device, thenI would definitely consider Ceto as an option for buying. Handsome! Ceto was created for those who badly need a quick delivery of nicotine in the body and want to achieve this in the fastest way. 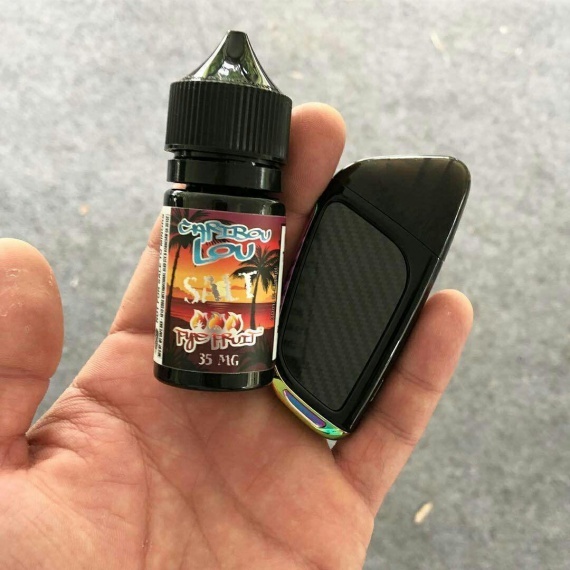 Hence the recommendation to use the novelty with liquids on salt nicotine. In addition, if you believe the manufacturer, the device can please imitation of a tight zyatyazhki thanks to a simple blowing system. The evaporator has a resistance of 1.5 ohm, and the reservoir contains 2 ml of liquid. Refilling occurs through the hole under the plug. The device receives power from the built-in battery at 370 mah (3.3V). Of course, there is an entire list of necessary protections – from short circuit, low voltage, recharge and cutoff in 10 seconds. Communication with the user is supported thanks to the LED indicator. Charging occurs through the micro usb connector. Author kittyurvapinPosted on August 27, 2018 Categories UncategorizedLeave a comment on Ceto by Rincoe – good-looking, and inexpensive. Maybe here it is, ideal? Company Rincoe has released all-in-one device Ceto. The device was equipped with a built-in 370 mAh battery, 3.3 volt output voltage and a 2 ml cartridge. Focus On www.urvapin.com For More Latest Vape News. June 4, the company Rincoe introduced in the instagram set Ceto . The device was made in a fairly solid, if not to say business style. The choice was given five colors, however, most of the surface was depicted in dark tones. The ends were decorated with panels “for carbon plastic.” On the front side, a small charge indicator and a USB port were installed. The voltage at the output reaches a value of 3.3 volts. The removable cartridge is equipped with an evaporator with a resistance of 1.3 ohms and a magnetic connector. The internal walls of the cartridge are decorated with the relief name of the company, and at the bottom there is a filling hole supplemented with a folding silicone plug. Fill the tank with up to 2 milliliters of liquid. The device is activated when tightened. Power is provided by a built-in 370 mAh battery. The scope of supply includes cartridge, USB cable and instruction. There is no fear that the white color of the dial will clash with the rest of the furnishing and decor in the room. It blends very well with every piece of furniture, the drapes, upholstery, carpets, and other curios in a room. 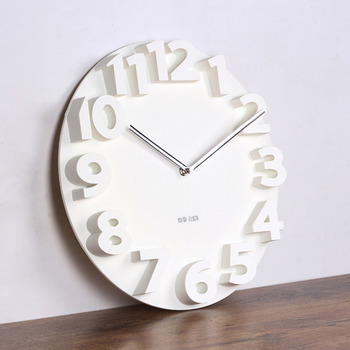 A white wall clock can be used in any kind of environment, whether at home or at the workplace. It is suitable for the kitchen, living room, bedrooms, conference rooms, office cabins, hotels, commercial establishments, lobbies, public transport terminals, airports, bathrooms, and anywhere else you can think of! The white dial ensures that the time can be read accurately even from a distance. This is special so if the number (or number-indicators) are in a dark color. Knowing the correct time can make a big difference between catching your train and missing it! In the kitchen, a white wall clock will help you to see the time from your workstation without having to stop work and move up closer. From vintage wall clocks to modernistic and contemporary, there are innumerable options available in shops as well as online. 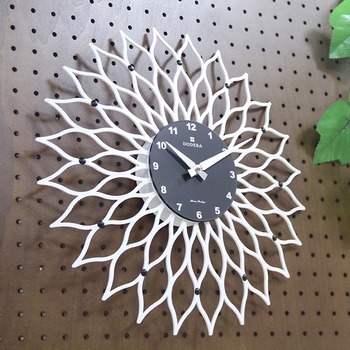 In fact, the choices of white wall clocks are far more than in any other colors. What type of white wall clock should you buy? Roger Lascelles, London Clock Company, Karlsson, Imhof, Swiza, etc. are some of the brands that have been manufacturing some of the best wall clocks since ages. The type of clock you need for your wall will depend on what kind of furniture and decor you have in that particular room. If you have antique-looking furniture, you should go for one of the vintage wall clocks with a white dial. This will match the antiquity of the furniture, will be functional, and will not clash with the wall color. For those who have a fascination for Cuckoo clocks, you can choose from a number of famous brands. 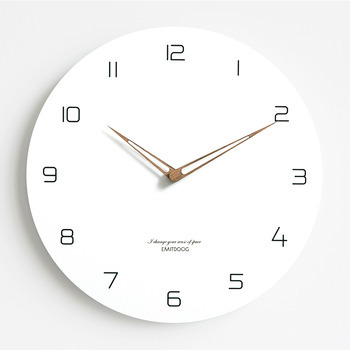 A Cuckoo-type white wall clock will usually also have a white cuckoo-case and will have the usual cuckoo chime as well. 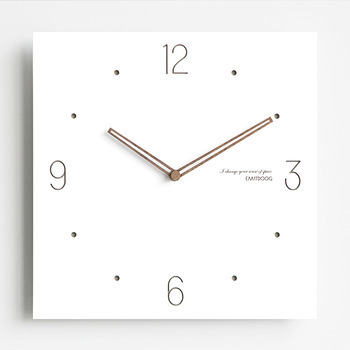 Among the contemporary white wall clocks, there are many varieties as well. The simplest one which is most suitable for kitchens is the 10-11″ white dial clock with black numbers or indicators. This is also the first choice for commercial establishments like offices or shops. The latest trend in white wall clocks is a unique concept. It does not have a dial at all! In fact, it has only the movement, the hands of the clock, and the digits. 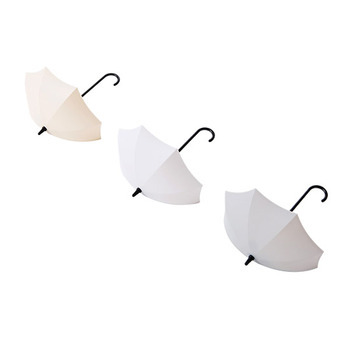 These can be fixed directly onto the white wall. Embellishments like wall decals can be used with these clocks to give them an aesthetic look. In conclusion, you can never go wrong in buying a wall clock because it blends with any type of furniture, any environment, and any wall color. wall clocks! From wall clocks to desk clocks, find the right timepiece for you! … New. Glenmont Gray and White Framed Wall Clock $89.99. If you have huge fun of an organized home, then wall hooks can help you stay even more organized. Only spending a couple of dollars, these hooks can literally transform any space in your home. Using them, you can be able to create millions of projects. They can be used for various different purposes and they can help declutter your home by simply hanging items. As stated before, there are many projects you can make use these hooks. Here are just but a few creative and inexpensive ways to do so. One of the most valued possessions of any parent is the artwork of their children. Show off your children’s creation by hanging them in your child’s room or your living room. Using the picture rail hooks to hang them on your walls. To add a classy touch to the creation, you can use grosgrain ribbon to hang the sleek frame on the hooks. You can have a wall hook near the door so that you can always hang your purse there whenever you walk through your door. This makes it easier for you to reach it when you are leaving the house. It also avoids wasting time going around the room to look for your purse. One of the biggest trends these days especially in the kitchen is that hanging pans and pots where they are visible. So, if there is an empty area and wall in your kitchen that you want to spruce up, use wall hooks to hang your pans and pots. Such a project is one of the most excellent ways to update your kitchen and make it look elegant without having to spend so much money. Are you looking to find some more storage space in the bathroom? If yes, then you can simply use these hooks to hang a few wicker baskets on the walls of your bathroom. You can then use the wicker baskets to store toiletries, towels, and even extra toilet papers. Using hooks to hang baskets in the bathroom walls to create more space is an excellent way to add an elegant look and a nice touch to any bathroom while decluttering. With a small bedroom, you might have a limited space, and you might struggle to find a good space where you can store your jewelry. There is no need to hide it. It is beautiful, and should be showcased. Use your beautiful jewelry as an art and display in your bedroom. Use a wall hook to arrange your beautiful earrings and necklaces in a beautiful pattern. This will not only give you some extra storage space, but will also decorate a bare bedroom wall and make your room more beautiful. 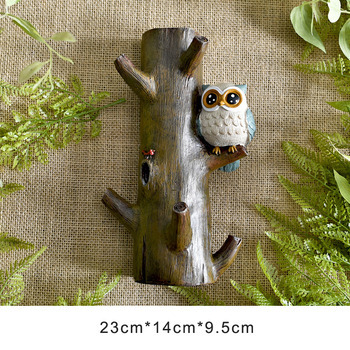 There are many other excellent ways you can add a great look to your home by using wall hooks. Good thing is, they are very affordable, but can be used in millions of different projects. Be more creative with them and think on many other ways to use them.